In the early 1990’s neither of us, Judy nor Larry, had experience with crop hay production. 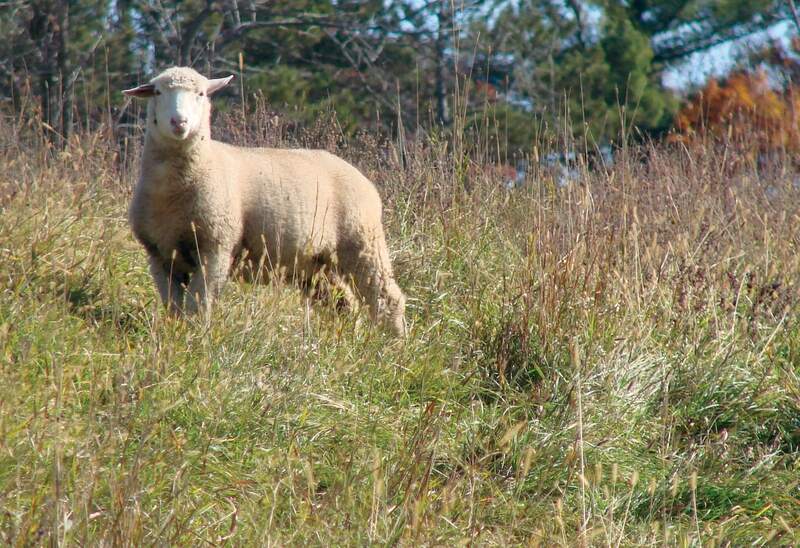 Raising sheep on pasture seemed like a natural option. But early in the 1990’s pasture and grass fed wasn’t considered to be a practical method of raising livestock. Balanced corn-based rations were the standard. Raising livestock on native grasses was not as simple as it sounds. Forages and grasses goes through different life stages just as sheep do. Fast growing, young grass is idea for lactating ewes and growing lambs. As the grass matures and becomes tough (more cellulose) the nutrition drops and it becomes difficult to chew. It is fine for ewes after weaning when they only need a maintenance diet but lambs require higher nutrition and softer fiber. 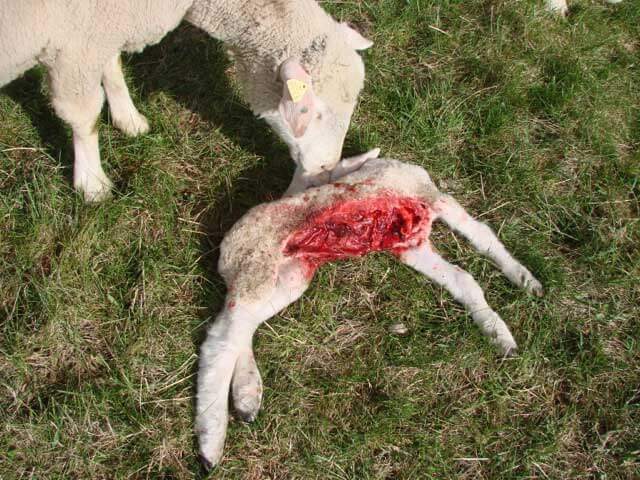 Lambs on mature grasses may even develop blisters on the roof of their mouth. The standard livestock references of the time did not discuss this. Instead, diets based on corn (carbohydrates), soy (protein) and byproducts (inexpensive fillers) were analyzed and recommended. Lambs grow slower on grass than when on a grain concentrate diet and so they never matched the cited weight gains or fat cover illustrated in the research. Finishing lambs on grass. Few were doing this at the time and most sources stated it was not only undesirable but couldn’t be done without risking the health of the lamb. Lambs do well on pasture while the ewe is lactating sufficiently to meet their growth needs. But as the lambs become older, and reach near the size of the ewe, milk is no longer adequate. In the upper Midwest, the first frost is usually in September. The grass may still look green but the sugars drop significantly to provide nourishment to the root systems. Only a small percentage of our lambs had the genetics to grow to finishing size on pasture. 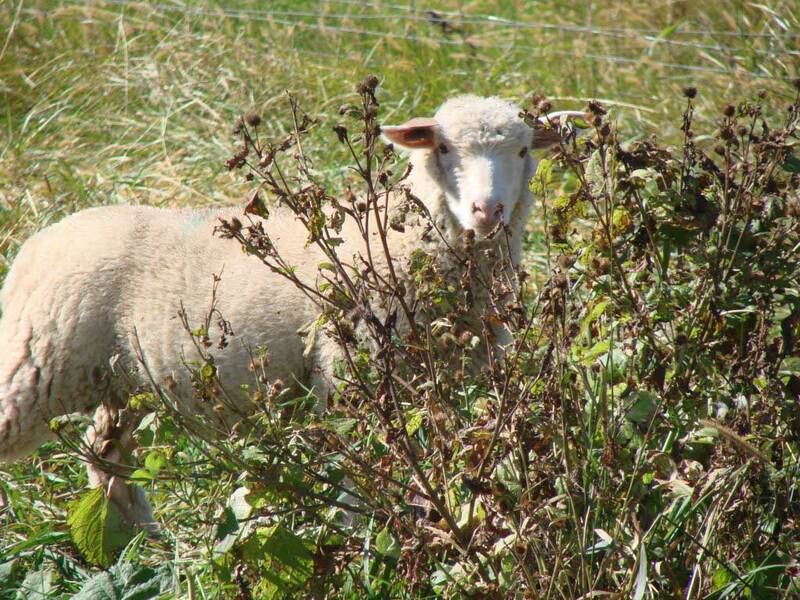 Some breeds of sheep do much better on a forage diet than other breeds. And within the breeds some individuals perform better. We began selecting for grazing ability but this takes years. Condition of the leased land: The land we leased was sand, rocky, eroded and with a low, grass cover. Healthy forage is dependent upon the condition of the soil. Improving the land base would take time and without adequate nutrition lambs do not grow optimally. Coyote kill took 1 of the ewe’s twins. Predators: We did not have buildings—only woodlots for protection from weather shared with coyotes. Protecting lambs from predators was difficult even with the addition of guardian dogs and llamas. We added some mobile busses but the zoning board quickly objected. Human predators: We were surrounded on two sides by new housing within an easy commute to an urban area. In the winter snowmobiles chased on the 200 acres cutting through fencing. During deer hunting season the area was canvased by hunters as an exceptional buck took refuge in the middle of our flock. When someone shot an arrow directly through the back, under the spin, of a pregnant ewe we decided to move. (A veterinarian removed the arrow and the ewe delivered twins 3 weeks later). At this point we began searching for a farm of our own to better control bio diversity and fertility while improving the flock’s genetics. In 2000 we purchased an overgrown dairy farm from an elderly farmer who was born on the property and had never spent a night away. Although, we have chosen not to certify our farm as organic we wanted land that would meet that criteria. Land free from pesticides and herbicide and clean water are important to us on a personal level. My son died in his twenties from Hodgkin’s leaving a wife and 2 year old granddaughter. My oldest sister died from pancreatic cancer. My brother died from Burkitts Lymphoma. Healthy foods, free from contaminants may not be the full solution but we are certain of the benefits.